…But now, things have changed. Tragik’s sixth album bursts with a different kind of energy. Vincent has laboured for many years in the shadow of the great AOR originals, but that long apprenticeship is now yielding the kind of results that stand on their own two feet. The evidence is a batch of finely crafted songs, brimming with memorable melodies. Vincent turns it all – like the tautly stretched ‘Where Would I Be’ (a song that suddenly launches into an MOR chorus) and the appealingly plaintive ‘Someone’s Gonna Hurt You’ – into performance art, passionate, powerful. And on ‘You Are The One’ and ‘When The Darkness Falls’, he clearly knows how to do intimate too. It’s no surprise that the music is derivative still – show me something that isn’t – so the real trick is in merging the past with the present. Vincent gets huge help from lead guitar guests Vince O’Regan and Peter Cox. To say their solos are perfectly pitched and beautifully measured suggests cold precision. That would be wrong. Both temper their axework in the heat of Vincent’s emotive, compelling delivery, adding a calculated bite and a metrical sting to his sweetly sturdy melodies, carrying their share of the load, creating light and shade. It would be difficult to overestimate their contribution. Read it in full here to find out why it got a 8/10! Belgium Webzine Rock Report has published a very favorable review of the latest Tragik album giving it no less that 4.5 out of 5 stars!! 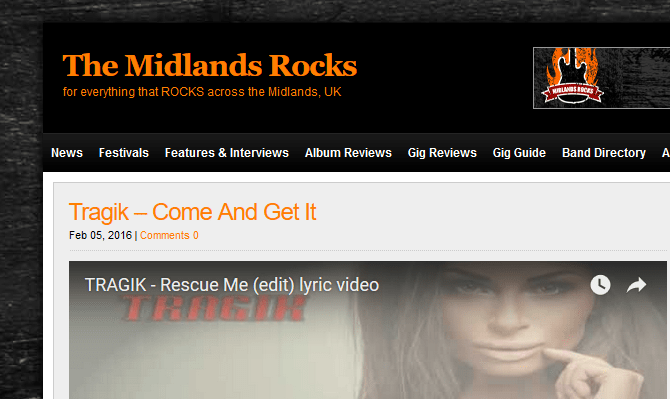 Hot on the heels of the release of the Come And Get It album by Tragik (critics and radio are loving it by the way), we have released a lyric video for an edit of the track Rescue Me from the album. Just to give you a little more taste of it, in addition to the 4800 or so people that have seen the sampler video! Tragik is the creation of Phil Vincent, amongst others vocalist with bands like Legion and Forest Field. And indeed, this new work ‘Come and Get It’ is published by the label Rock Company, owned by Peter Cox, leader of Forest Field who participates in the guitars here. It is the sixth release of Tragik and to all the fans of the genre, a sublime work of melodic rock, with the voice of Vincent having a touch of Kip Winger. There are songs for all tastes: from the initial melodic “Where Would I Be” and “Fallen Angel” outstanding ballad “You Are The One” through “Feed My Soul” with more hard rock elements in “Smoking Gun” It gets more progressive and heavy but still melodic in “Rescue Me / Rise to The Sun,” a 12 minutes song with a piano and inbetween a turn to a pop song, with many overlapping keyboards. “Someone’s Gonna Hurt You Tonight” is a wave of Hagar Van Halen era, while “Can’t Slow Down” is Tragik at their heaviest. “When Darkness Fall” is more melodious, where the piano carries the rhythm and the chorus is most catchy. “Closer to the Sun” sounds like a Dokken light and the disc ends with “No Words”, an instrumental that begins with a guitar lick and towards the end evolves to one guitar with natural background sounds. The only downside could be that the battery is programmed but they are so well made that you hardly notice. For fans of bands like Boston, Foreigner and Winger, ‘Come and Get It’ is a must for this year. * small note, the drums are not programmed but played by Phil but still thanks for this awesome review! ** translation by Google with a little help, so hope we did the words justice! “Come and Get It” is the 6th album from TRAGIK, one of the projects / band from workaholic Phil Vincent. While Vincent announced he left his other group Legion to pursue a solo career, here’s another effort from Tragik, alongside his partner in this band, guitarist Damian D’Ercole. Tragik is perhaps Phil Vincent’s most melodic rock band where he lends to a more personal material, even in an earnest manner than on the solo albums under his own name. Combining massive hooks, multilayered vocals, heavy guitars, atmospheric keyboards, thunderous bass & drums, “Come and Get It” fires on all cylinders. There’s some friends contributing guitar solos to provide even more fire, such as Vince O’Regan (Legion), Peter Cox (Chinawhite) and Billy Roux (ex Tragik). From the Foreigner-esque opener “Where Would I Be…?” to the hard rocker “Fallen Angel” (Winger come to mind) to the Journey meets Boston melodic rock of “You Are the One” (a highlight), the new Tragik album shows its ‘classic’ credentials. “Smokin’ Gun” is another moving melodic rocker, “Smokin’ Gun” adds a hard rock groove, “Closer to the Sun” is filled with lots of harmony vocals and a sharp D’Ercole guitar work, while “Someone’s Gonna Hurt You Tonight” is a fine melodious semi-ballad with some Tyketto in it. There’s also the quite interesting 12 minute opus “Rescue Me / Rise to the Sun” which shows Tragik’s progressive tendencies blending harder moments with melodic passages in the vein of John Elefante. It has been said many times here on this blog, Phil Vincent never disappoints. “Come and Get It” is another solid product from his inexhaustible factory. This new Tragik effort is varied like never before, the songs are well constructed, performed, produced & mixed. The only weak point is the dodgy artwork, but c’mon, who does not like a hot bimbo accompanying a rock album? The postman has just delivered the new Tragik album at the office. So here it is, a look at the new TRAGIK album. We are confident that everybody who likes melodic hard rock will have a blast with this album. It is a stunner!